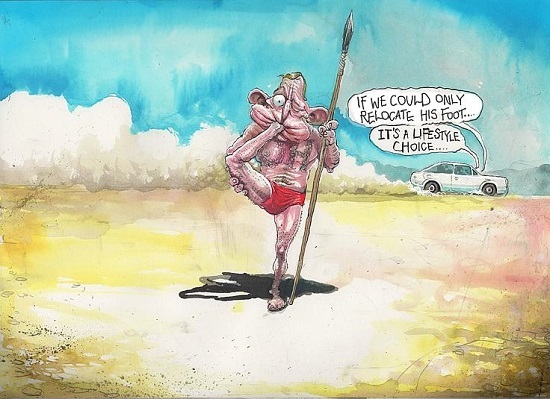 This David Rowe cartoon comes from the days when Tony Abbott actually led the country. Originally he had been a weathervane on climate change. However, as Katherine Murphy points out, he had done enough positive work on climate change as a leader, for example by signing us up the Paris agreement and retaining the RET, to disqualify himself from speaking to a group of climate denialists in London. She thinks is latest frolic is sad and cynical – just Abbott being disruptive as usual. In the AFR Philip Coorey says his colleagues have fallen silent, whereas Labor is questioning his state of mind. “Loopy” was the term used by Tanya Plibersek. Joe Hildebrand at new.com.au says the politics of insanity have taken hold in Australia. GLOBAL warming is good for you, postal votes will kill you and the most trusted politician in Australia just spent a day chasing sheep through the streets of LA. Welcome to the politics of insanity, where it’s cool to be crazy, crazy to be sane and reality is simply whatever you want it to be. Abbott has finally jumped the shark, and is trying to prove himself the buffoon his enemies claims him to be. The SMH, the ABC, and Michelle Grattan. The New Daily ran a report from AAP. The SMH with Tony Koziol reports Abbott saying “I have learnt to speak my mind”. Last night I heard a 12-minute or so interview of Abbott by Tom Switzer. 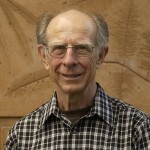 Abbott was deep into alternative climate science, spruiking heat islands, manipulation of temperature readings, claiming the temperature had risen in Australia by only 0.3C, that the hottest decade in the US was the 1930s, and that now it had been firmly established that temperatures did now rise between 1996 and 2014. These and other denialist talking points show that he really believes this stuff, he isn’t putting it on. I would regard him as a sideshow, which Turnbull could and should ignore. However, he has a vote, Eric Abetz came out supporting him, and, more importantly, Craig Kelly, who chairs the government’s Environment and Energy Committee, agreed with much of what Abbott said on ABC RN’s Drive. Kelly says that warming is good for us up the two degrees, than it’s bad. Abbott, of course, likened climate action to “primitive people… killing goats to appease volcano gods.” Giles Parkinson says that Policy will be a mess until Turnbull sacrifices Coalition’s climate goat. Parkinson speaks as though Turnbull has a choice. His own backbench apart, that promise was made to the skeptics and denialists who run the National Party who sit around the cabinet table, and who are still there. While Barnaby Joyce is there, nothing will change, and Joyce has made it clear that anything that gets in the way of coal is unacceptable. For Australia, “the only rational choice is to put Australian jobs and Australia’s standard of living first, to get emissions down but only as far as we can without putting prices up”. Just as Turnbull talks of the short, medium and long term in energy policy, so does Abbott. In the short term, “we have to get mothballed or under-utilised gas back into the system”. In the medium term, there must be no subsidies for renewables, and a freeze on the present Renewable Energy Target; the government must build a coal-fired power station; the gas bans must go. Also “the ban on nuclear power must go too”. In the longer term, “we need less theology and more common sense about emissions reduction. It matters but not more than everything else”. Abbott gestured to what seems to be happening in government policy – but then set the bar higher. Abbott’s harangue might be, as those in the government are putting it, “off the reservation”. But it also highlighted how the Coalition hardliners, who extend in number well beyond the tiny Abbott clique, have constrained Turnbull in this fraught policy area. As they chafe at the march of renewables, the hardliners are also determined to maximise the gulf between government and Labor on energy policy. But business, with a longer perspective, is desperate for a position that minimises partisanship. Turnbull knows that in policy terms, the latter is the better way to go, while he is being driven toward the former by his troops and by the need for a battle ground on which to fight Labor. Peter Hannam at the SMH has Five charts that show Tony Abbott is the one who has lost sight of the science. See also Marc Hudson’s Tony Abbott, once the ‘climate weathervane’, has long since rusted stuck. However, it is not about the science. These people will not change their minds, and will avoid bipartisanship for political reasons. They must be defeated politically. Previous PostClimate clippings 117Next PostAbbott’s ‘Daring to doubt’ – how does the science stand up? In breaking news, the current PM says “there has been too much idiocy on energy policy”. By my count, that is a 3 word phrase. Ms Credlin let the “carbon tax cat” out of the bag, when she explained that hammering PM Gillard on the big bad tax, was all huff and puff by the big bad wolf. Mr Abbott’s allies mostly fell silent. Mr Joyce has a Court of Disputed Returns to deal with. Many businesses and their shareholders, the Business Council, many other lobbyists, several political parties and States, want climate policy sorted. If Mr Abbott thinks the coalition can win a Federal election under his new banner, he has coals in his head. I’m confident he has already lost this particular fight. He’s on the losing side of the Battle line. Frazer, Kennet, Rudd and Gillard all moved on from defeat to do useful things for society instead of wasting their lives on bitter recrimination. Abbott and some of his allies should have a hard look themselves and consider what contribution they could make outside of politics. Endless bitter and twist is not good for their health or reputation. I’m convinced Abbott is hanging around like a bad smell because four more days in the position would qualify him for a Prime Ministerial pension. something in fire fighting? something in lifesaving? aboriginal welfare? TV ads for a new line of male swimwear? spokesperson for the Australian Onion Association? memoirist? Or could it be seniors boxing tournaments? No, wait. He’s getting plenty of biffo by staying on, snarling. Does it follow from your hypothesis, that the plotters removed him before that by-election rather than after it, expressly to deny him a larger pension? If so, PM Turnbull is a more stringent hater than I had supposed.